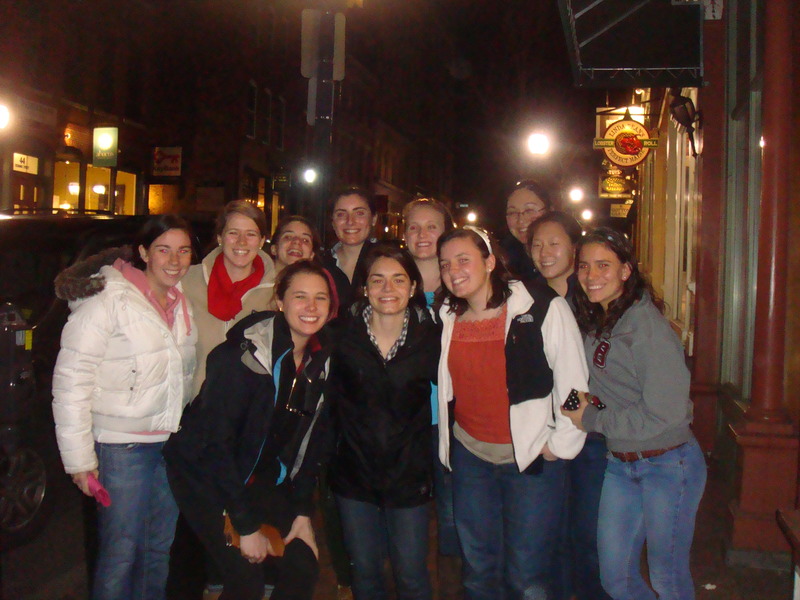 Last week both the men’s and women’s teams decided to stay in Maine for the start of their seasons. In the past several years the Cats have headed south to Florida to train, but knew they could work just as hard staying on campus. 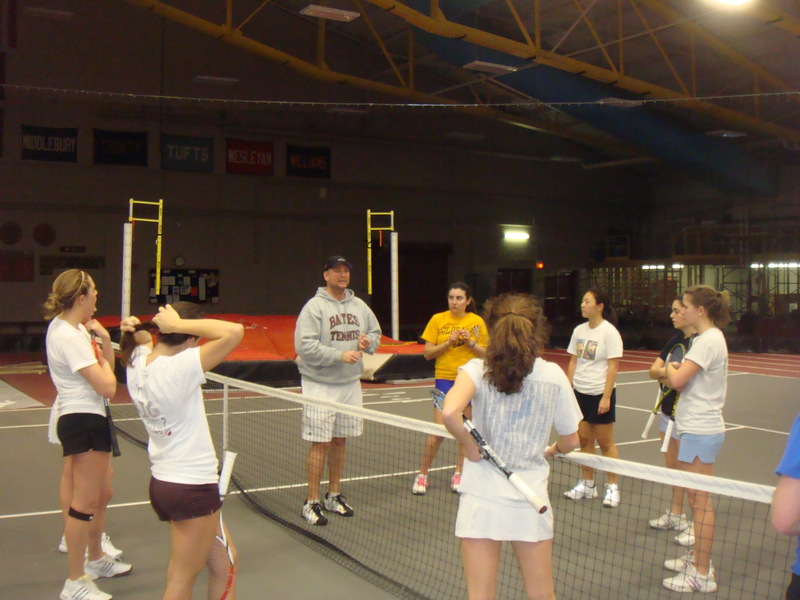 On Monday and Friday of the week they headed down to Portland to get some hitting in since the courts in Merrill weren’t available, the rest of the time they spent doing double hitting sessions at Bates. It was a tough week, physically and mentally, but everyone ended the week knowing they had improved. The coaches could really see how much the off-season training was paying off, as many players were almost in mid-season form. 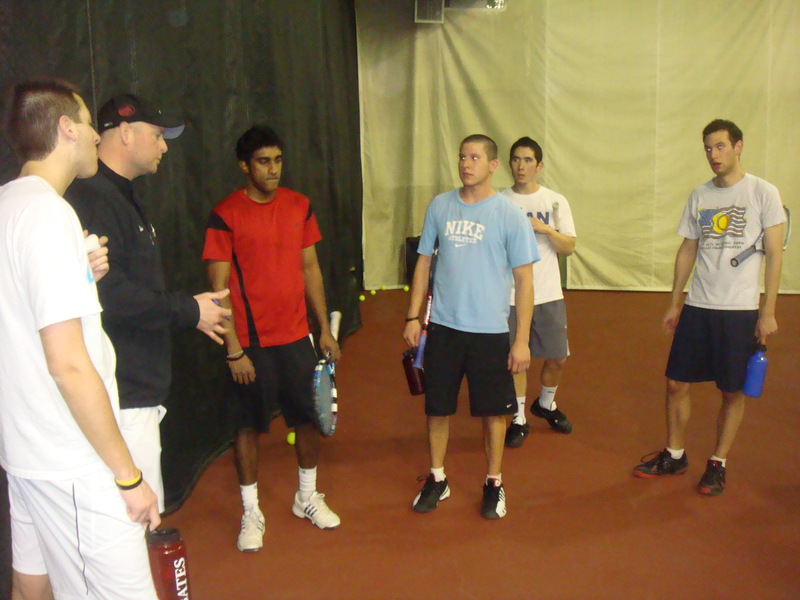 The double hitting sessions were spent letting each player find their groove, as well as figuring out possible double’s pairings. The Cats also played matches against each other to get ready for their dual matches against several region opponents. All in all it was a great week of tennis and should prepare the Cats well for their upcoming contests against USM and MIT for the men, and Mt. Holyoke and Smith for the women. Of course February break isn’t all about tennis. 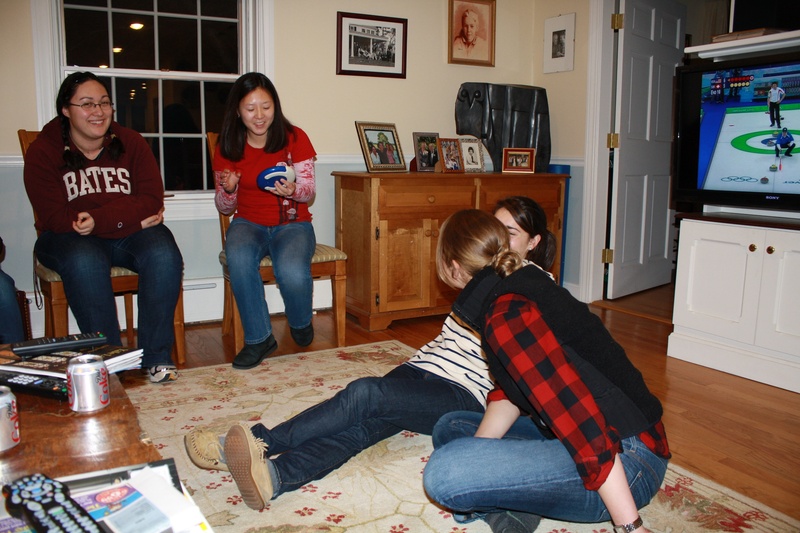 The women got together and did a number of night activities. 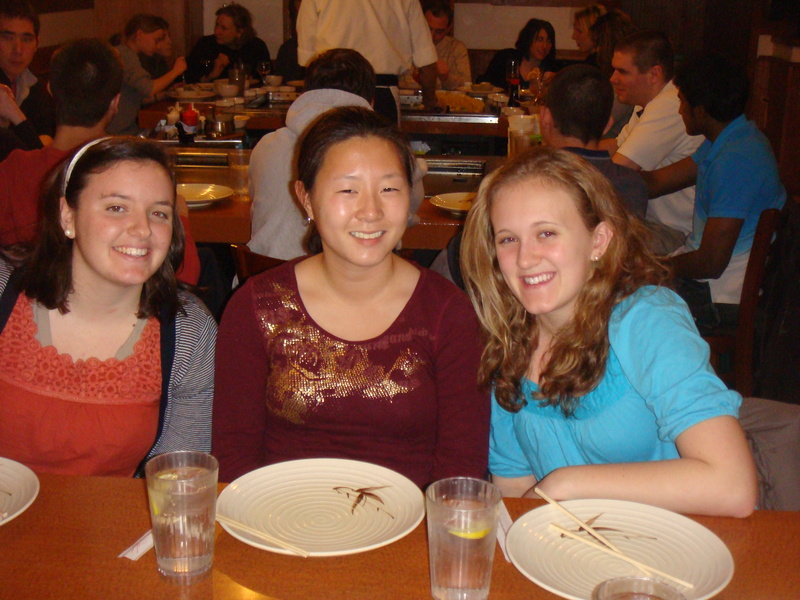 One night they went to Jean’s house in Falmouth for a home cooked dinner with her parents. 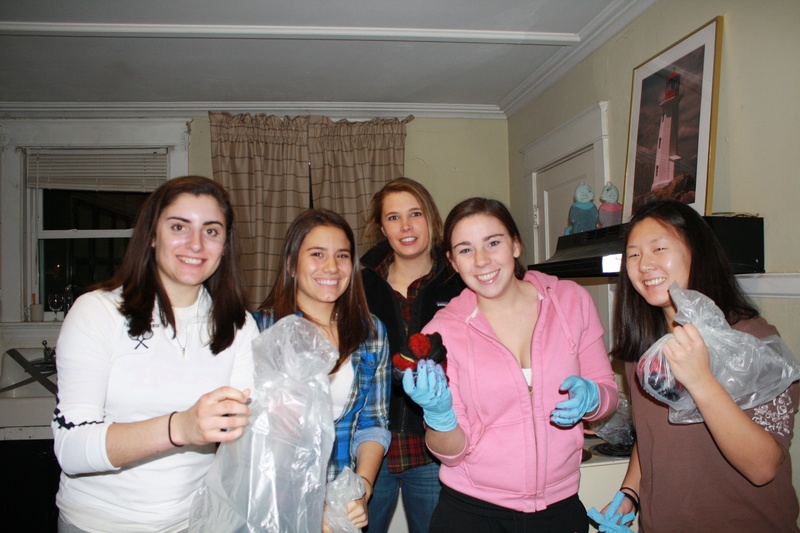 Another night was spent tie-dying shirts, even though I’m not too sure how they came out. Every night for both teams was spent with long team dinners in Commons, enjoying the fact that there was no hurry to get to the library or to crack open a book. 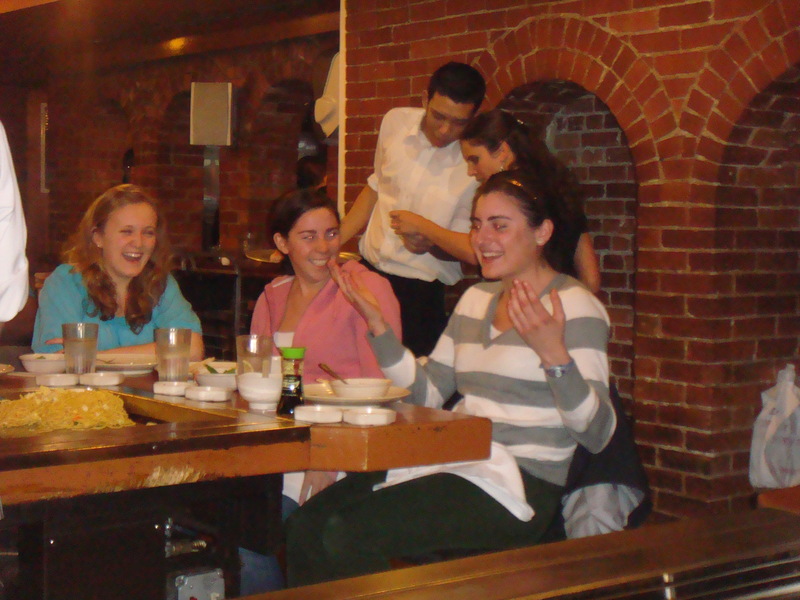 On Friday night, while down in Portland, the Cats went out to a dinner at a great hibachi restaurant, Fuji. For some it was there first time at one of these most entertaining dining experiences, for others they knew what to expect as the chefs came out to work their artistry on the grill. 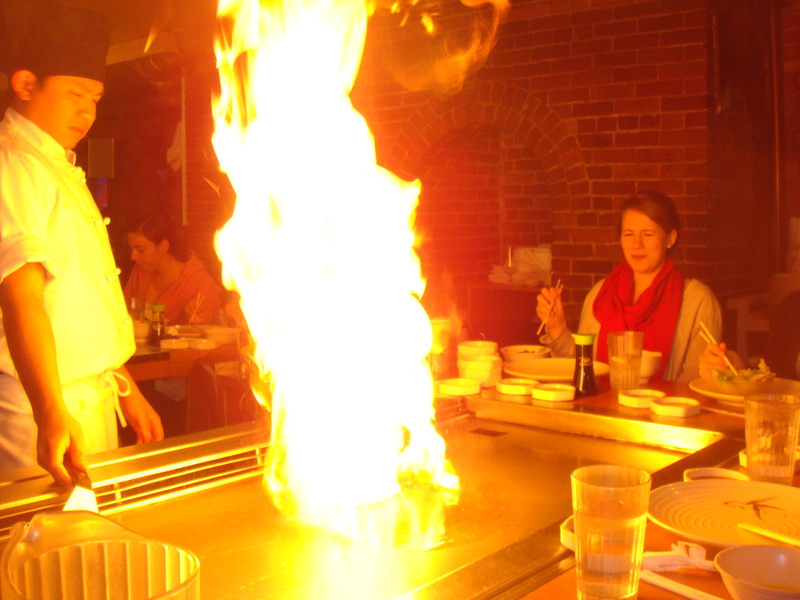 As always, the meal was filled with lots of laughs, great food, and a few high rising flames from the grill. It was a great way to end the week of hard work and as the Cats drove back to Bates on Friday night, they could already tell this was going to be a great season. 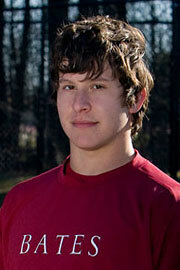 The Cat’s come into the 2010 season with a lot of familiar faces and a couple of fresh ones. They also enter the spring with an expectation to finish with a higher ranking than the 6th place in NESCAC and 23rd nationally they received last year. 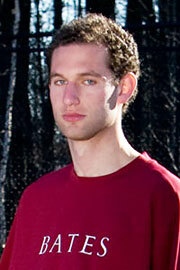 The men are ranked 20th in the nation and open the season this Saturday, Feb 27, with two matches. The first match being at 10am against USM and the second is against MIT at 3pm in Merrill Gym. Another key weekend for the Bobcats is when they travel to Ohio to face three teams in the top of the Central region rankings, Case Western, Denison, and Kenyon. That trip will take place March 26-28. The men must also travel to Bowdoin this year for their annual showdown with the rival Polar Bears on April 30th. Full schedule can be found if you scroll down on the blog. The Cats are lead by three senior captains (pictured), Max Berger from Concord, NH, Mike Reiss from Rockville Centre, NY, and Zach Fenno from Armonk, NY. They have been instrumental in challenging the team throughout the offseason to work harder than ever before and will continue to demand excellence from their teammates in the classroom and on the court. Joining the three of them are two more seniors. 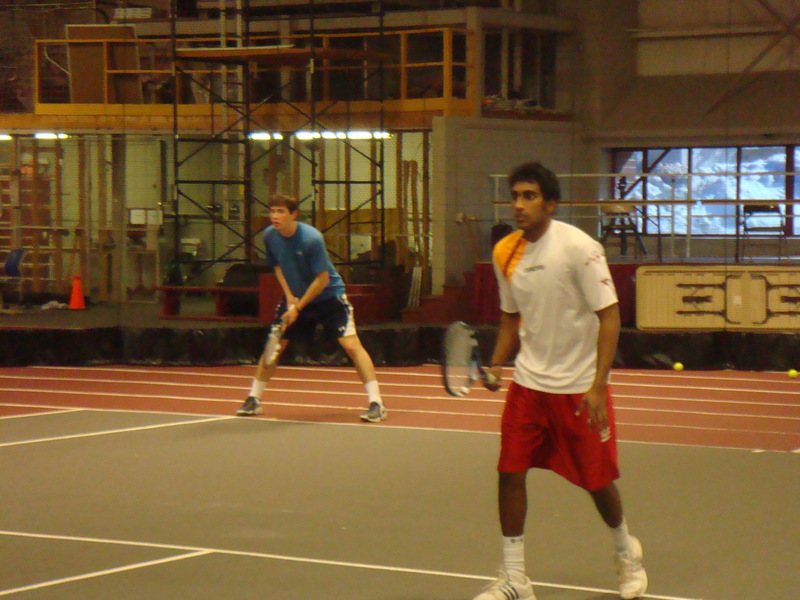 Ryan Mannelly from New Canaan, CT and three time All-American and 2009 NCAA Doubles National Champion Amrit Rupasinghe of Colombo, Sri Lanka. Sam Woods from Cambridge, NY is the only junior and hopes to impact the line-up after an injury plagued sophomore season. Jeff Beaton, a sophomore from Haverhill, MA played #3 doubles last season and with the improvement he has shown from his training in the summer and fall will look to continue to score points for the Cats. The new faces I spoke of earlier are Kyle DeSisto of Cohasset, MA, Rob Crampton of Wilton, CT, Dylan Reffe of Washington, DC, and Matt Bettles of Taunton, England. Coming in, the coaches knew about Kyle’s athleticism, but his serve and openness to coaching have everyone excited about his future as a Bobcat. 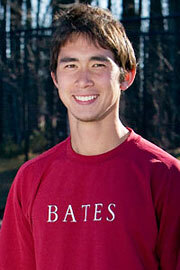 Rob came to Bates with a solid New England ranking but fought injuries for much of 2009. He is finally healthy and ready to show what he can do against our NESCAC foes. Dylan, a walk-on, has been a pleasant surprise for the Cats. His work ethic, willingness to do whatever the team needs, and his consistency from all over the court has raised the level of play for anyone he hits against. Matt has come all the way across the pond to help take this program to the next level. A crafty lefty, Matt has some of the best shot making ability on the team. Adding these four young men to a team that already has so much experience should be a recipe for success. This should be a great year for the Cats and we hope you join us throughout the spring. If you can’t make it on campus to see us live, make sure to follow us right here on the team blog all season. The Bates women’s team is excited about the season ahead of them. The starting line-up will be full of youth just as it was last season; and with the leadership of senior co-captains Alex Piacquad and Jean Gulliver, the Cats look to finish higher than they ever have in the NESCAC. The team started official practice a week ago on February 15th, and spent the February break week practicing right here at Bates. The first match for the women will be on March 6th at Mt. Holyoke, a team they defeated last year. 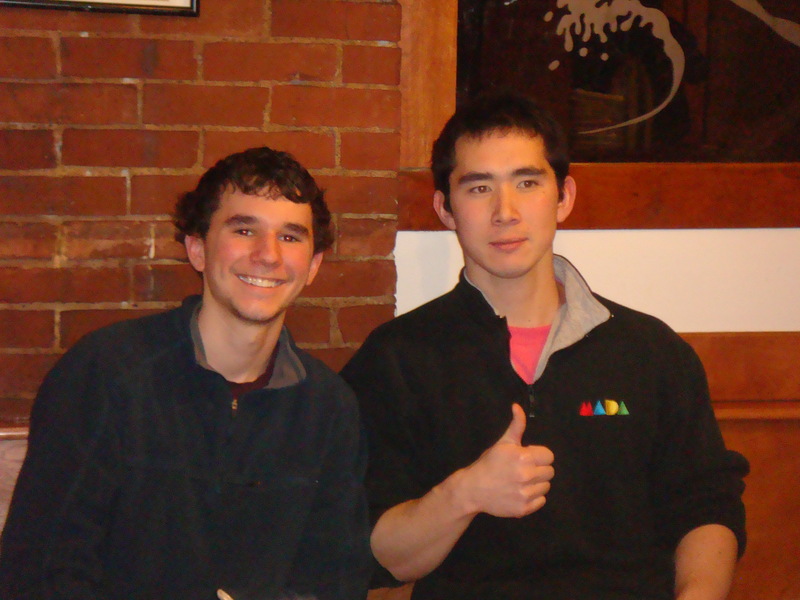 Their first home match will be a week later on March 13th against the MIT Engineers. For the complete schedule continue to scroll down on the blog. As the aforementioned Piacquad(left) and Gulliver(right) have done a great job leading the team on and off the court throughout the year, they will be joined by some talented first-years. Katie Helfgott from Newton, MA brings a powerful game to the Bobcats and will look to dominate her opponents with the serve and forehand. Jacqui Holmes from Harvard, MA has shown great tenacity during her matches in the fall and an unbelievable work ethic in the off-season. Ashley Brunk from Phoenix, AZ has surprised the coaching staff with her ability. She has a great all court game and a mental toughness that will be necessary playing in the toughest conference in the nation. Adrienne Jaeger from Bath, ME has improved immensely from the fall and looks to continue getting better throughout the spring. Jenna Burke joins the Cats from Burlington, MA and has shown a sneaky transition game and good closure on the net. 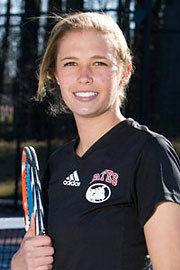 She hopes to use her net game to help improve the strength of the Cats’ doubles teams. 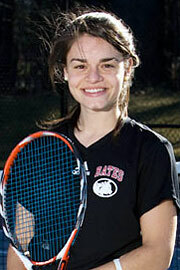 Rounding out the class of 2013 is Nicole Russell from Boca Raton, FL. She helped the Bates volleyball team to a 16-9 season in the fall and brings a ton of athleticism and one of the best overheads in the region to the tennis team. The class of 2012 who did so much last year to raise the level of play for this team, have continued to improve as sophomores. 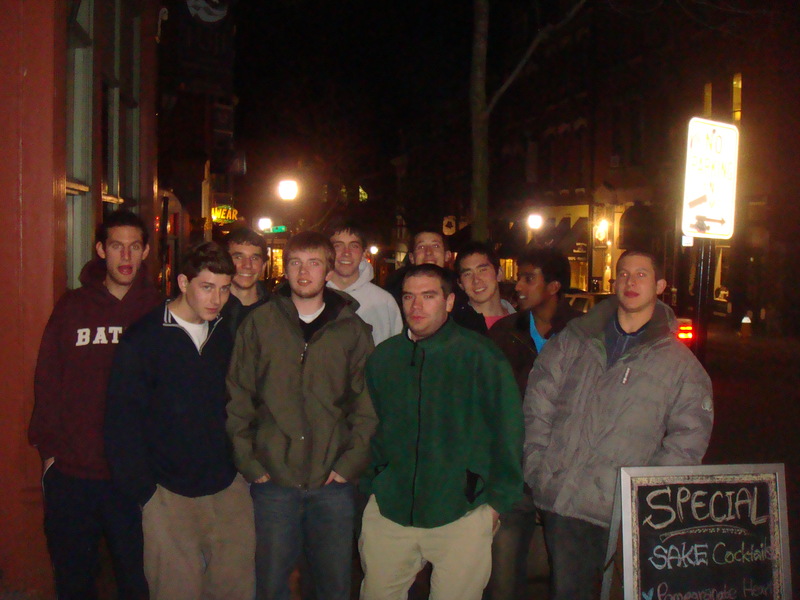 They are much more mature as they have a whole season of playing in the NESCAC under their belts. It is easy to see them as veterans since they played in almost every match last season, but they still have three exciting years to lead the Cats to new heights. Make sure you look for Meg Anderson of Cohasset, MA, Erika Blauth of Camden, ME, and Nikki Bugajski of Brookline, MA when checking out the results this year. The Cats hope to see as many people out at the matches this spring whether it is right here on campus or checking us out on the road. This is going to be a great season and we hope you are as excited about it as we are.